In certain situations hairfollicles are in need of extra nutrients. These extra nutrients are important for supporting the growth of a hair. That is why Priorin was developed. Priorin has a special combination of natural nutrients, like millet extract, wheat germ oil, L-Cysine and vitamin B5 that help nourish the hairfollicles. 1 capsule a day with plenty of water, preferably after meals. Do not exceed the recommended daily amount. wheat germ oil, gelling agent (gelatin), sorghum extract (contains eg soy and lactose), glycerol, thickener (yellow beeswax), sorbitol, emulsifier (lecithin), stabilizer (magnesium oxide), vitamin B5, coloring agents (iron oxide and titanium dioxide), L-cystine, flavors (vanillin and methoxyacetophenone). 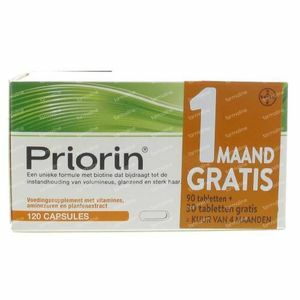 Priorin capsules contain: gluten and lactose.